While the 75 year old BQE triple cantilever must be rebuilt, we are advocating for better temporary solutions. The BHA is working with the community, planners, and engineers to develop a better solution and have presented it to DOT and to our City and State elected officials. 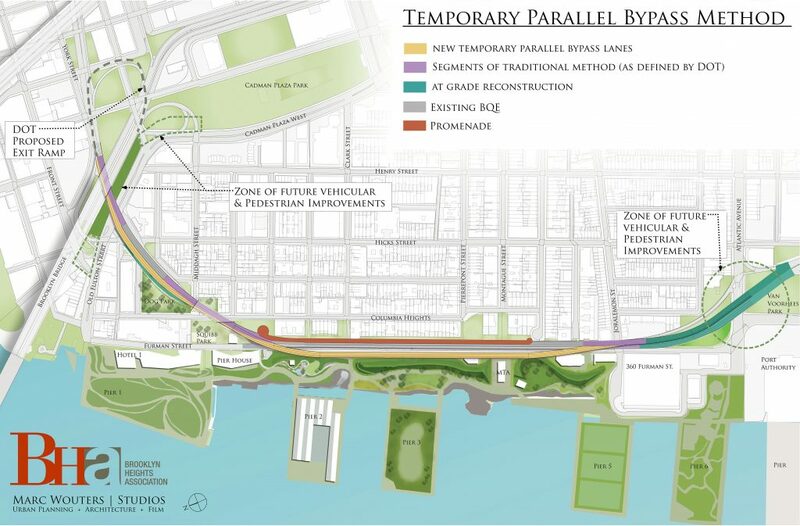 We have created a separate menu for the BQE, which includes a description of our alternative concept, a run-down of DOT’s two proposals and why we consider them to be unacceptable, and a page with links to all the news coverage and other BQE related references. Last but not least, you will find an easy guide of actions you can take, including the contact information for all our representatives. The large turnout at the rally on the Promenade with Comptroller Scott Stringer, Senator Brian Kavanaugh, Brooklyn Borough President Eric Adams, Assembly members Jo Anne Simon and Latrice Walker, reps from Congresswoman Nydia Velazquez and City Council member Stephen Levin, the Brooklyn Heights Association, the Cobble Hill Association and A Better Way sent a strong message to the Mayor and DOT. They must allow meaningful community input; they must find an alternate plan, whether it is the parallel Highway solution the BHA presented to the DOT in November or any other plan which takes the health and well-being of ALL impacted communities into account. Their Promenade Highway is NOT the right way. Thank you for joining us! Read more about the rally in the Brooklyn Eagle. In a letter sent on January 7, 2019, the BHA asked DOT Commissioner Trottenberg to emulate the MTA’s recent announcement of a new approach to repairing the L Train tunnel by re-thinking DOT’s approach to the BQE reconstruction project. Our letter highlights the parallels between the L Train and BQE projects: they both pose huge engineering challenges, and the government’s initial approach in each case would impose devastating consequences on neighboring communities. In asking DOT to re-think its approach, the BHA formally entreated DOT to halt its planning for the Promenade Highway and to seek outside, independent experts with a fresh perspective to devise a 21st century solution. The BHA met on November 19th 2018 with DOT Commissioner Trottenberg, the project’s engineers and other DOT officials, as well as with Councilmember Levin, Senator Kavanagh, and Assemblymember Simon and their representatives, and a representative of Borough President Eric Adams, for a two hour discussion concerning the BQE Project. As of January 8, 2019, we have still not received any feedback. To challenge the three assumptions on which DOT based its plan for a 6-lane “Promenade” highway, which involve staying within the city’s right-of-way; accommodating the same level of traffic as present; and limiting the project’s planning to only that which is under the City’s control. To ask our local City and State elected officials how we can work with them to achieve a better solution through a range of actions by the State and other government agencies. To discuss alternatives to the Promenade Highway, including a concept first conceived by Marc Wouters Studios, a Heights-based architect-urban planning firm with which the BHA has been working. That concept would move traffic to a temporary 2-level structure west of the existing triple cantilever instead of DOT’s 6-lane highway on the Promenade. The concept would impact the Park’s berms to some extent but would not affect the Park’s useable space, and would involve noise protection features so that the area now occupied by the berms could become useable parkland post-construction. In addition to avoiding the terrible impacts of DOT’s Promenade Highway on numerous residential buildings along Columbia Heights, as well as on 360 Furman, the concept offers other advantages, such as various construction techniques that could accelerate the project’s completion. No solution is likely to be perfect, however, and this concept would entail more temporary lane closures at certain locations than DOT’s preferred plan, making traffic management techniques an important part of this alternative approach. The BHA advanced this proposal to illustrate solutions that could be achieved if DOT could work with other government agencies to alleviate the narrow constraints it has imposed upon itself. Commissioner Trottenberg agreed to have DOT engineers assess the alternative concept in the coming weeks, though she provided no specific timeframe. Senator Kavanagh and Assemblymember Simon agreed to work together to initiate a conversation with the Governor’s Office and State transportation agencies to determine the State’s willingness to assist the City with implementing better approaches to the project, including measures to better manage traffic on the BQE. For its part, the BHA will engage with the community to promote better cooperation by DOT with the State and other government agencies that will be necessary to bring the best possible plan for the BQE to fruition. 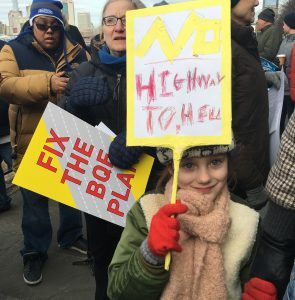 On Monday afternoon, the BHA, in conjunction with representatives of A Better Way NYC, met with a roster of major New York civic and preservation organizations to enlist their support in opposing the Promenade Highway. The representatives of these organizations voiced a strong concern for the highway’s impact on the Promenade and the metropolitan community, and offered both valuable ideas on how they can contribute to opposing the DOT plan as well as their support of our efforts to move DOT to adopt a better solution. The outcome of the mid-term elections and the leadership change in the State Senate could potentially pave the way for passage of a long-delayed congestion pricing plan that would place tolls on the East River crossings. This measure would reduce traffic on the BQE, making alternative construction approaches more feasible and mitigating their environmental impacts. With this new political opportunity, the BHA will advocate for the passage of this congestion pricing plan. As we all know, the Promenade is a draw for all New Yorkers, not just those in our neighborhood. The traffic congestion resulting from the BQE Project will affect everyone. To ensure that all stakeholders are supportive of our objectives, the BHA is consulting with our sister neighborhood associations to keep them fully informed of our efforts. The New York Landmarks Conservancy has joined us in our effort to oppose the six lane highway on the Promenade.